Amazing news! Small batch of DIPDuinos now for SALE! You can buy your own DIPDuino for only $69.95. If your are interested, please contact me via Contact Form on this website to discuss payment ad shipment options. HURRY UP! Quantity is limited! ( ! ) 30 Days Money Back Guaranty. ( ! ) 90 Days free replacement and upgrades. I have an idea to sell small quantity of DIPDuino’s to interested hobbyists. So, the question is - what will be the reasonable price for DIPDunio? Yes, it is quite expensive to make because of 4-layers PCB and components on both sides, howeverone DIPDuino is capable to replace and Arduino equipped with some of very popular shields, all without need for stacking boards one of top of another. In fact DIPDuino is amazingly compact package. DIPDuino also hase ZigBee communication capabilities similar to one provided by Microchip Technology - MRF24J40MCT-I/RM. You can buy it it Mouser for only $19.44. Next is OLED display from Adafruit (I am a big fan of Adafruit). They sell it for a reasonable $17.50 . Your total budget for DIPDuino-like system will be $78.39. 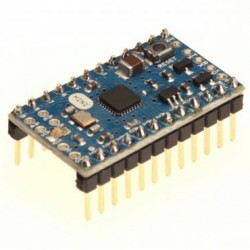 This does not include DIPDuino’s SRAM chip and you will probably use some pins of your Arduino Mini Pro to interface with modules listed above.